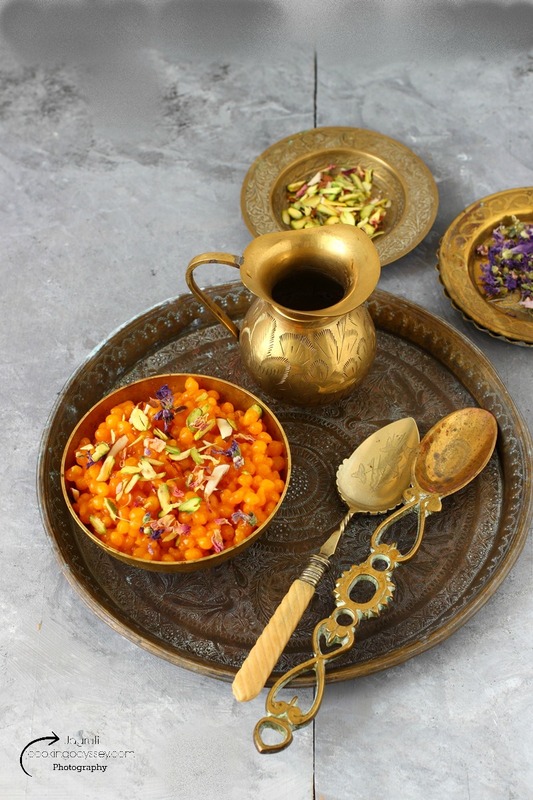 Kesar Mango Boondi, traditional sweet boondi prepared using fresh kesar mango pulp, an incredible taste with an exotic sweet flavour, surely tastes marvellous and your taste buds will do happy dance ! 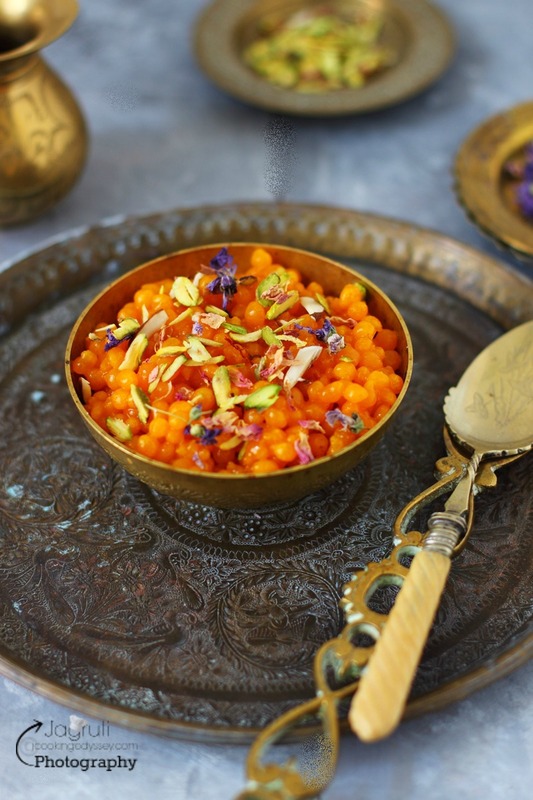 Sweet traditional Boondi ( Deep fried gram flour pearls soaked in sugar syrup )or Boondi Ladoo are our all time favourite Indian mithai, usually I prepare in my house when we perform religious ceremony at home or simply when I crave for it ( not too often though ). As you all know , I always have an urge of making little bit of variation here ( Meethi Boondi Kheer ) and there ( Palak and Beet Masala Boondi ) in my cooking, so this time traditional boondi had it's turn. Kesar Mango Boondi, came out perfect and delicious. If you are looking for an inspiration to serve traditional desserts with innovation , this sweet dish is perfect. While mango season is in full swing, don't miss the chance to celebrate mangoes ! 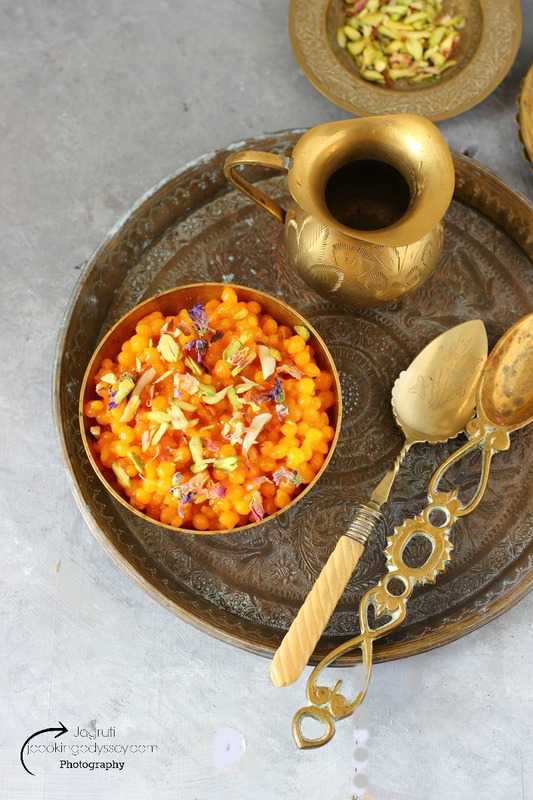 Traditional sweet Boondi with a little twist, drenched in Mango Sugar Syrup, just incredible ! Sieve besan and add enough milk to make the batter like Idly mix consistency. Switch off the heat when it comes to a one string consistency. Add cardamom powder , Remove from the heat. Add saffron, ghee and mango pulp. When all boond are done. 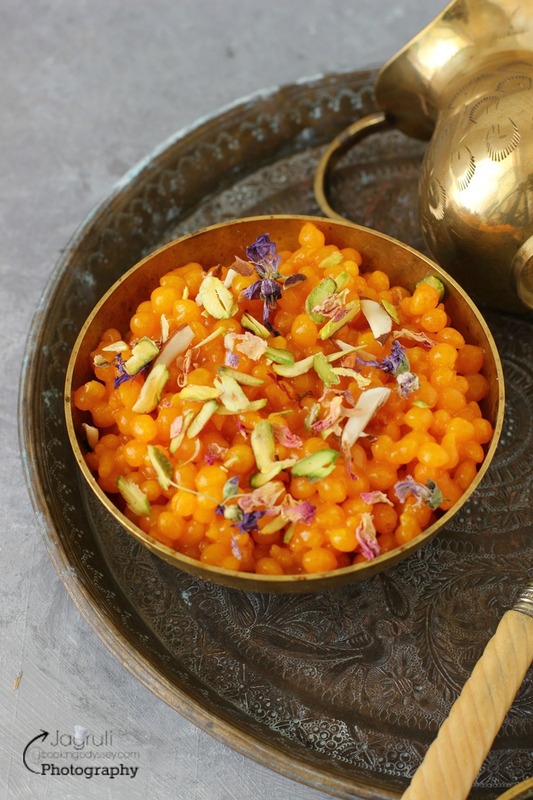 Let the boondi soak in the syrup for about half an hour, making sure boondi are fully coated with the mango sugar syrup. When you press boondi, you should feel the stickiness. Garnish with the nuts and mix well.